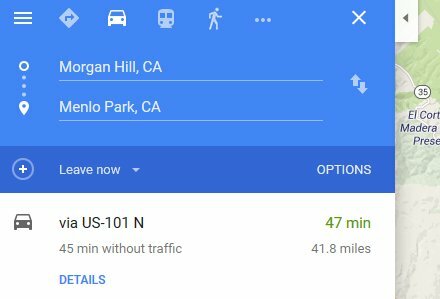 I don't know if you knew this but you can check on Google Maps (on the desktop) to predict the traffic of where ever you are going for the next day and what time on that day. -Hit enter and you'll see the present driving time. Just above your driving time, below your start point/destination window you will probably see an OPTIONS bar. Then choose your hour and day and wallah! The typical time it would take to make this trip normally (As in, at the moment I presume) and the estimate of how long it would take during the time frame you've asked for. Or if you chose the 'Arrive by' time, it will tell you what time you should leave by. Of course this option cannot predict stupid behavior or bad luck on your route if an accident occurs. But otherwise, this can be a handy tool. Hey, for what it is, it's a handy tool if say, you need to hit up the doctor's office during the height of the traffic and you need to know what time you may need to leave to be sure you're not late. That is, if you care about your timeliness. What Brand of Coffee Does McDonald's Use? How does TinyURL Actually Work? WAZE or MAPS, Which Is Better?